July | 2013 | Small Farmers. Big Change. My name is Carly Kadlec and I have been with Equal Exchange for just over two months. I am a Green Coffee Buyer. 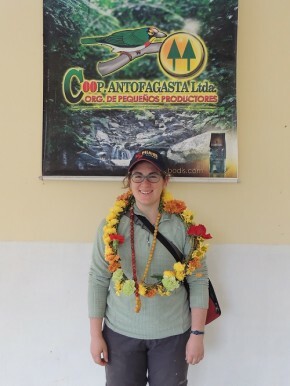 I just returned from my first big trip to visit coffee farmers in Peru and Bolivia. A big part of my job is this sort of “origin trip” to visit farmers and see how their harvest is going, discuss our quality standards with them, go over the previous year’s contracts with the co-operatives, and discuss the greater world of coffee face-to-face with farmers. When I explain that these trips to faraway places are my job, a lot of folks just say, “That’s your job?! You’re so lucky!” Read more here. Losing a cow is like having your savings account wiped out. Several animals were lost to the family farmers of the Cooperative José Gabriel Condorcanquí in Peru when this past March, unusually heavy rains fell for a few days and caused small mudslides. The innumerable shade and native trees farmers maintain around their coffee plants limited damage, but for those small-scale growers who lost livestock and stables, the loss can push them to the economic brink. 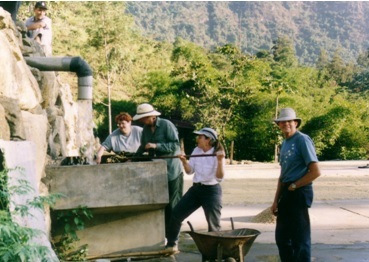 Equal Exchange works with democratically-organized small-scale farmers. In northern Peru, those growers farm a handful of acres on which they cultivate their own food and coffee intercropped with orange, banana and shade trees. When the harvest is bountiful and prices are good, growers will use extra income to invest in animals – cows, goats, chickens, etc. When savings are needed for medical bills or a wedding or other big life events, those animals can be sold to provide the income. Several growers lost that safety net. 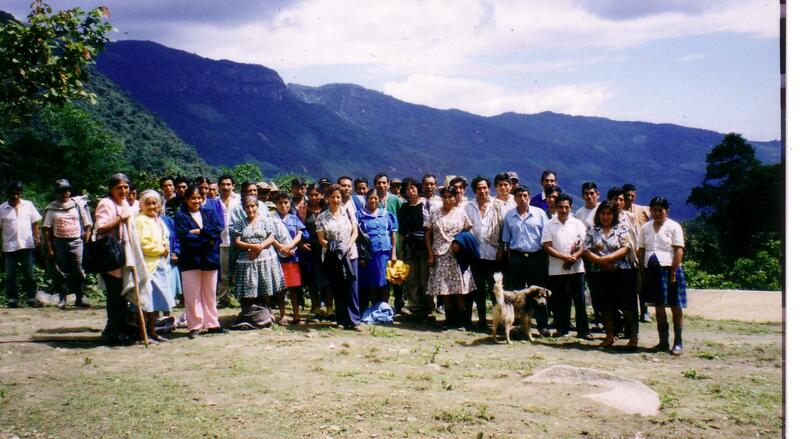 In response, the members of Condorcanquí are developing plans for a co-op built and owned stockyard. “This project will improve the nutritional options not only for the farmers but also the entire population especially the school-age children, expecting mothers, and elderly members,” explains Arnaldo Neira, co-founder and general manager of Cooperativa José Gabriel Condorcanquí. This year will not be the year farmers recover from the loss. World coffee prices are low and yields are down. 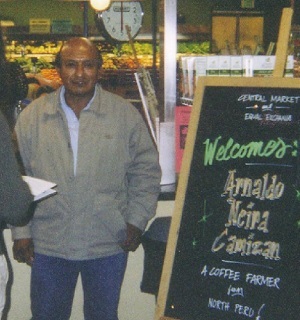 Equal Exchange pays prices the farmers set democratically to ensure a dignified living. This level, defined by the Small Producers Symbol certification program, is 75% higher than the current world market price. Prices for coffee have fallen because the crop looks to be very good in East Africa and Colombia (and hopefully benefitting our farmer partners at Gumutindo, Sidamo, and CCAOC, as well as in Brazil and Vietnam. While yields are good in some areas, the farmers in Peru at Condorcanquí are facing substantial crop losses due to the yellow coffee rust. 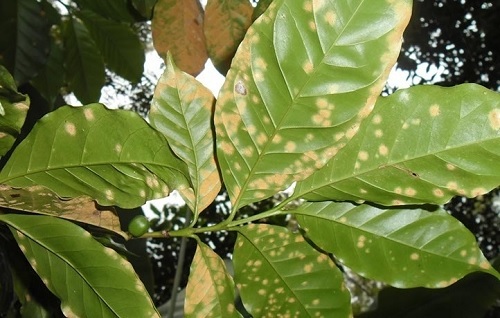 This plant disease, which weakens the coffee tree and thereby reduces fruit development, spreads quickly and is affecting growers from Mexico to Bolivia. The farmers of the co-op are fighting back with organic disease-control methods and, through their national level organization, have already won government assistance following a meeting with the Minister of Agriculture. These efforts will likely bear fruit but not in time to save the 2013 crop. Despite it being a tough year, the farmers of Condorcanquí are excited for the upcoming visit by the same store managers who first visited their village of Coyona a decade ago. This week, Bob Gerner of the Natural Grocery Company, Michelle Franklin of La Montanita Co-op, Hilary Dart of BriarPatch Co-op, and Marni Furse of Markets of Choice will return to Coyona a decade after their first visit. There they and several other Equal Exchange customers and staff will live and work with the farmers exactly 10 years after the first visit to see first-hand the effects of fair trade. Also joining the tour are Kimberly Hash of Lakewinds Natural Foods, Joe Damiano of Greenstar Co-op, Claudia Crowder of MOMS Organic Marketplace, and Domie Brown, Hilary Johnson, and Rafael Aviles of Equal Exchange.